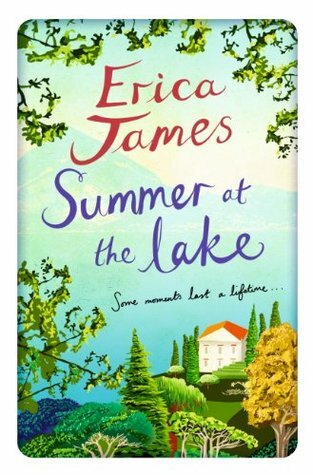 Summer at the Lake by Erica James – It's Time to Read! Floriana loves her job as an Oxford tour guide and thrives on the variety each day brings – one day it could be leading an Inspector Morse and Lewis tour, another day it could be a Pre-Raphaelite tour. Her biggest failing is that she’s a habitual procrastinator and this leads her to put off telling the one true love of her life how she felt about him until it was too late. Now, out of the blue, after two years of not speaking, she receives a card from Seb announcing his forthcoming marriage. It’s a card that sets off a chain of events that ensures life is about to change for Floriana. For if she hadn’t been so distracted by Seb’s news, she would have seen the car coming. . . And if she’d seen the car, there would have been no need for Adam Strong, a local property developer, and elderly spinster Esme Silcox to rush to her aid. And if she hadn’t met Adam and Esme she would never have had the courage to agree to attend Seb’s wedding in beautiful Lake Como. But if she goes, can she be trusted not to leap from her seat and cry, ‘It should have been me!’? I received this book from Netgalley to review – thank you Netgalley and Orion Publishing for letting me read and review this book. I love Erica James. The first novel of her’s that I read was Hidden Talents, and from there she has been one of my favourite authors and I have read almost all her books (I have a couple on my TBR pile, and cannot wait to read them). Like all Erica James novels, this book had me hooked from the beginning and did not let me down. The story follows three people: Floriana, Adam and Esme. The synopsis talks a lot about Floriana but I found that the character that stood out the most to me was Esme. Floriana is worrying as she walks home from work about that dreaded “Save the Date” card that her old friend Seb has sent her. She is so lost in thought that she steps off the pavement and in front of a car that is speeding. The car drives off and leaves Floriana on the road. Fortunately, Adam and Esme, two strangers, are on hand to rush to her aid. This opens up a new friendship for the trio and their lives become entwined. As the friendship develops, we step back in time to hear about Esme’s summer at the lake in Italy and how it completely changed her life. The story jumps between the past and the present as Esme shares her life, Adam breaks up with his girlfriend and has to move on and Floriana needs to decide, will she go to the wedding? I really enjoyed this book. I particularly like books that are set in the past and present. This novel reminded me of books written by Kate Morton and Rachel Hore – two authors I really enjoy. I found Esme’s story captivating. I wanted to know about her time in Italy and her relationship with her father, a wonderful artist. I wanted to know how she had ended up alone in her eighties. I really liked her. She was kind and compassionate. I found it a joy reading about her life changing with these two new friends – it was like she had found hope again. Esme was the stand out character in the book for me and I really liked her. If she was real, I would like to know her! I think this sums up the book. It is filled with hope – the biggest being that even in your eighties you can make friends who will change your life and you don’t have to be lonely. This novel is currently rated as 4.07 out of 5 stars on Goodreads and it is easy to see why. There is an element of predictability in this book, but I didn’t find this spoilt the read for me. What I did like was there was no cheesy epilogue. It could have been easy to add on a chapter set a year later with everyone in love living happily ever after. I was so pleased that Erica James chose to not write that. I have rated this 4 out of 5 because it was a lovely, quick read. The descriptions were beautiful (I know want to go to Italy a lot!) I liked the characters, particularly Esme and I thought it was a brilliant storyline. Pingback: The Dandelion Years by Erica James | It's Time to Read!